by Akhil Reed Amar. New York: Basic Books, 2012. 615pp. Cloth $29.99. 978-0-465-02957-0. Reviewed by John E. Finn, Department of Government, Wesleyan University. jfinn [at] wesleyan.edu. 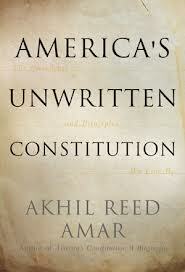 America’s Unwritten Constitution is a companion piece to Amar’s earlier work on America’s written constitution, sometimes referred to here as the “canonical” constitution or text. Read together, they are a comprehensive, compelling account of American constitutional life, opulent in texture, rich in imagination, occasionally idiosyncratic, and sometimes frustratingly incomplete. Most academic readers are likely to be familiar with Amar’s earlier work in constitutional theory, and hence will not be surprised that Amar reaffirms his long-standing commitment to textualism and to approaches to constitutional interpretation that take the text seriously. The obvious question is whether such a commitment can be maintained, or even should be maintained, once we accept the notion that there is an unwritten, or an extra- or a non-textual constitution. In the end, how one approaches this question depends less on the putative differences between the written and unwritten constitution and more on the nature of the authority we attach to both. There is, we might think, a difference between claiming that an unwritten or nontextual principle, practice, or precedent is part of an “unwritten” Constitution and claiming that such principles are interpretive aids in discerning the meaning of the constitutional script. Or to put it another way, when we claim such principles are part of the unwritten constitution, do we mean to argue that their claim to authority is coequal to or no different than the authority the (written) text claims? What sorts of claims does the written constitution make on the unwritten constitution? And perhaps more interesting: What sorts of claims does the unwritten constitution make on the text? Amar spends considerably more time describing the main features and principles of the unwritten constitution than he does explicating the nature of its authority. I don’t think it’s unfair to describe the work as more a work of archeology than constitutional theory, though there are elements of both skillfully woven throughout. By archeological I mean that among the book’s greatest strengths is its careful, almost loving engagement with constitutional history as a lived and as a live civic practice. One gets this sense almost immediately with Amar’s fascinating account of the impeachment trial of President Andrew Johnson and the debate over whether president pro tem of the Senate, Senator Benjamin Frank Wade of Ohio, is eligible to vote. (Because the vice-presidency was vacant, Wade was next in line for the presidency, and hence had a considerable personal interest in the outcome of the trial.) The written text is silent on the question. As Felix Frankfurter might have asked: How [*173] are we to read this silence? To guard against constitutional conjuring, or the fear that appeals to the unwritten text authorize judicial recourse to sources of meaning beyond the “constitution,” Amar posits a relationship between the written text and the unwritten in which the written text must have what I will call presumptive authority. Indeed, it is the presumptive authority of the text itself that authorizes recourse, sometimes, to the unwritten constitution. As Amar writes, “the written text presupposes and invites certain forms of interpretation that go beyond clause-bound literalism” (p.20). None of this directly addresses the obvious and long-standing objection that the unwritten constitution is still too plastic, too easy to manipulate, to cabin the sort of judicial mischief some decry as the “living constitution.” But Amar’s sense that appeals to the unwritten constitution “must understand not only where to start but also when to stop, and why,” (p.74) leads him to elaborate more fully on the relationship of the written text to the unwritten one –“The unwritten Constitution should never contradict the plain meaning and central purpose … of an express and basic element of the written Constitution… (p.74). The written Constitution deserves judicial fidelity, both because it is law and because, for all its flaws, it has usually been more just than the justices” (p.199). This is an interesting claim – or better, two claims. The first is that the written constitution has some claim on judicial fidelity because it is law. But what is the point of describing the unwritten principles and practices of the constitutional order as the unwritten “constitution” if not also to claim for them the status and superiority of law to politics? If both constitutions are law, then claiming that judges must be faithful to the law doesn’t really tell us why the written text trumps the unwritten one. Secondly, if the written text deserves our fidelity because it comes nearer to justice (are we to understand the written constitution first as justice-seeking and secondarily as populist? ), what should we [*174] do in those cases (surely there will be some, perhaps many!) when it is the unwritten text that is nearer to justice? So in the relationship between the written text and the unwritten “text,” the written has presumptive authority, in part because as Amar says, as I quoted above, that “the unwritten Constitution should never contradict the plain meaning and central purpose … of an express and basic element of the written Constitution” (p.74). But I wonder if Amar might imagine a few cases where the unwritten constitution does indeed trump the written text – perhaps because it comes closer to the vision of constitutional justice that inheres in the text, or perhaps because that principle has been “ratified” by the people themselves (e.g, Amar, 1994; Ackerman, 1993), and perhaps also because Amar notes that the interpretive tools we may use to determine the “unwritten substantive do’s and don’ts … are themselves components of America’s unwritten Constitution” (p.xiv). Amar seems to suggest the latter possibility in his discussion of “erroneous” judicial precedents. “An erroneous precedent that improperly deviates from the written Constitution may in some circumstances stand … if the precedent is later championed not merely by the court, but also by the people…. When the citizenry has widely and enthusiastically embraced an erroneous precedent,” a court “may view this precedent as sufficiently ratified by the American people…” (p.258). Putting aside the question of whether it is possible to reconcile this populist understanding of constitutional rightness with a justice-seeking account, this concession seems to admit there are times when the unwritten constitution supersedes the written one. Calling the unwritten parts of the American Constitution a “constitution” is more than just a verbal trick, because it ascribes to them a very strong element of constitutional authority, more than they get if we simply call them aids to interpretation. To be clear, I have no objection to this result. My concern is that Amar’s treatment of the precise nature of the relationship of the two Constitutions is not as fully developed as constitutional theorists might like. Similarly, some readers might desire a longer and more comprehensive discussion telling us precisely which documents and practices count as a part of the unwritten constitution and, no less significantly, why they count. But Amar is clear that constitutional theorists are not the primary audience for this important, masterful book. Amar’s audience is the citizenry the Constitution helps to create. This is the sort of book that every citizen (and scholar) should read, and more than once. Ackerman, Bruce. 1993. We the People: Foundations. Cambridge: Harvard University Press. Amar, Akhil Reed. 1994. “The Consent of the Governed: Constitutional Amendment Outside Article V,” Columbia Law Review 94: 457. Copyright 2013 by the Author, John E. Finn.